– selecting between classical tonal tradition and other contemporary approaches. We will leave all these dilemmas for another occasion, and concentrate only on the influence of the specific phenomenon which appeared at the beginning of the 1990s and became typical for music creation in the new century – the loops. There were two parallel lines which contributed to the appearance of loops – sequences and samples. 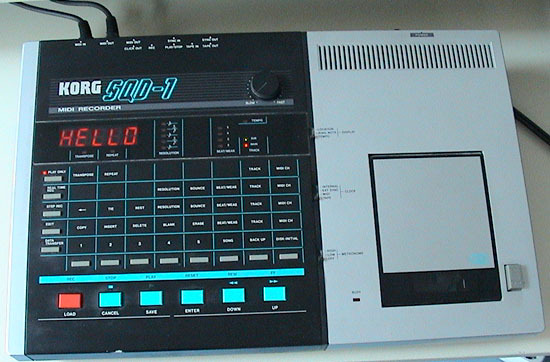 The sequences were introduced to music hardware and software through the MIDI protocol in the mid 80s. The basic music principle (and of course not only in music) of repetition was implemented in the philosophy of the new computer software, and soon, at the end of the 80s, MIDI sequencers where graphically developed from matrix to score presentations. 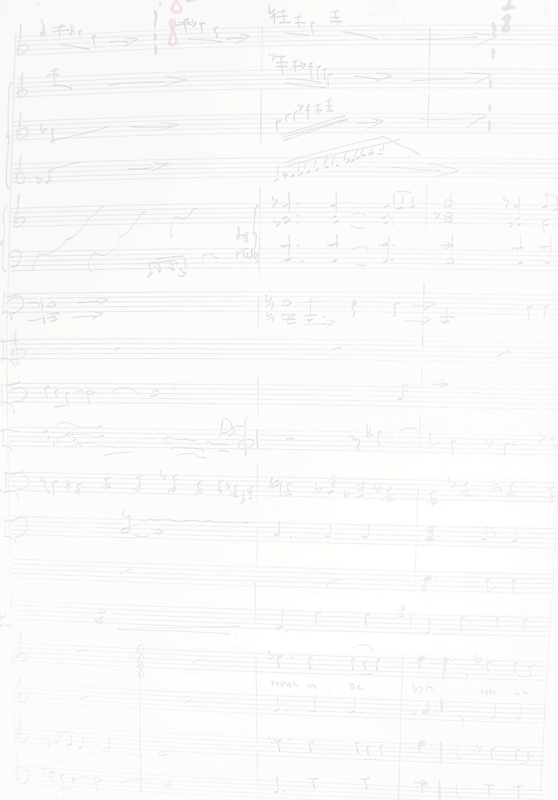 The MIDI protocol is still the basis of score processors, in fact it is their essential and an integrate part, and despite of the fact that MIDI technology is already very outdated, i.e. too slow for the capacity of the computer hardware, the world still operates with the old rules fixed in the mid 80s. Its interchange ability and general use enabled it to survive much longer than the use of any other protocol. At the beginning of the 90s, the first commercial HD audio recording hardware and software (such as DigiDesign Pro Tools) integrated the sequencing principles. Based on the MIDI sequencing principle, the recording process was built around audio sequencer, again presented through the timeline of the recorded music piece. It was already predictable that at the next stage, (when the capacity of the hardware will be able to handle video), the sequencing principle will be extended to the video area. 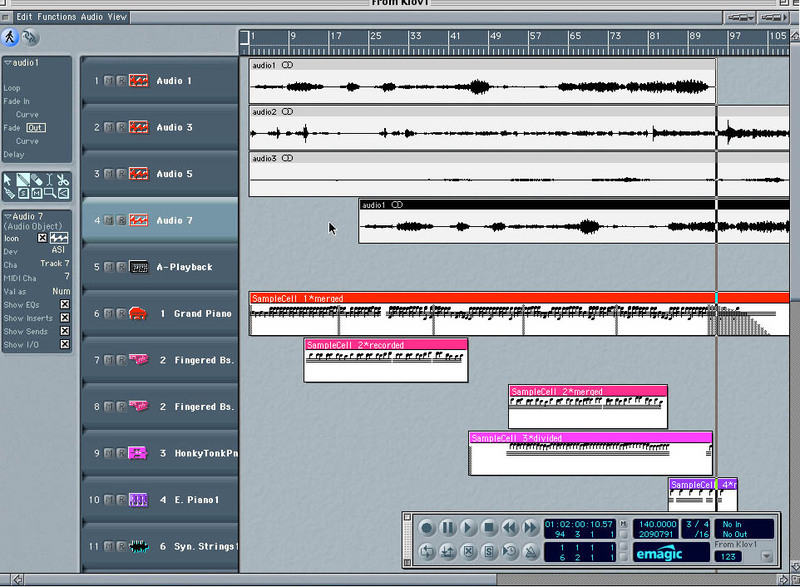 Today, all video recording software uses sequencing with separate or integrated audio sequencers. 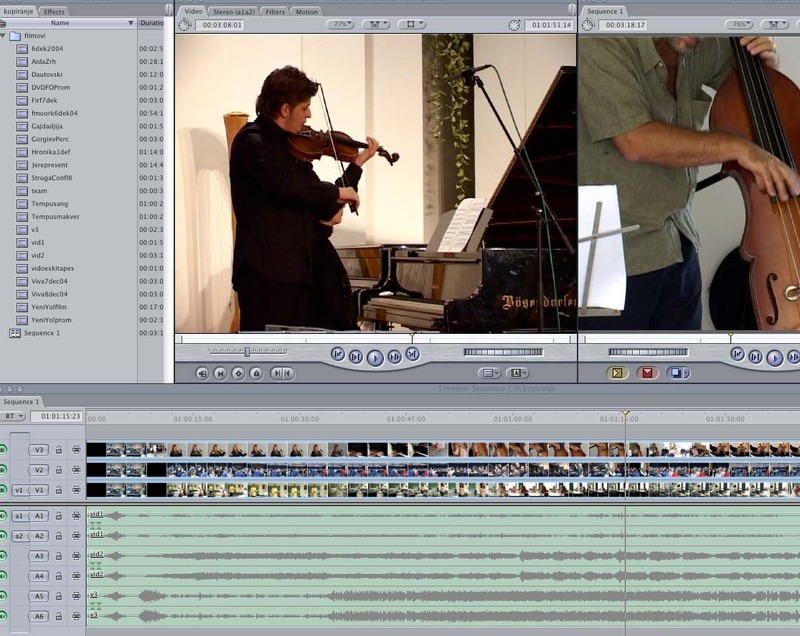 Furthermore, most of the audio recording software, in addition to having audio and MIDI sequences, also have the capacity to drive video sequences. Once the sequencing principle was established, the loops appeared. They were treated either as an indefinite repetition of a sequence, or a part of a sequence (a sequence within a sequence). In fact, there is almost no difference between a sequence and a loop, as sequence could be defined as a loop which appears once or several times, while the concept of a loop always includes at least one repetition. Today, we are inclined to think of a sequence almost as something identical to the music piece, forgetting that the basic idea behind sequencing was to integrate several sequences into a piece. Thus, the loops are something smaller than a sequence. The first MIDI sequencers were used to drive sounds from different sources – analogue or digital. Digital sound sources were based on another important principle – sampling. 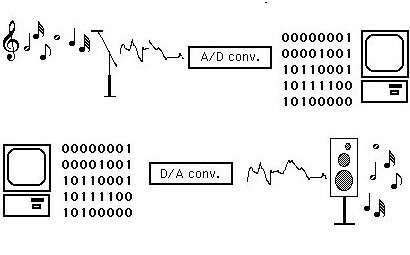 Audio sampling, which is in fact the conversion of the analogue into a digital signal, had to deal with the problem of loops. In order to build indefinite sound sustainability without clicking between the repetitions of the original short sample, once again, the loops were introduced. The limited capacity of the commercial music hardware at the end of the 80s and the beginning of the 90s could not compute larger algorhythms, not to mention the building of an instrument, which needed a matrix of overlayers of samples in differenet registers, techniques of performance etc. 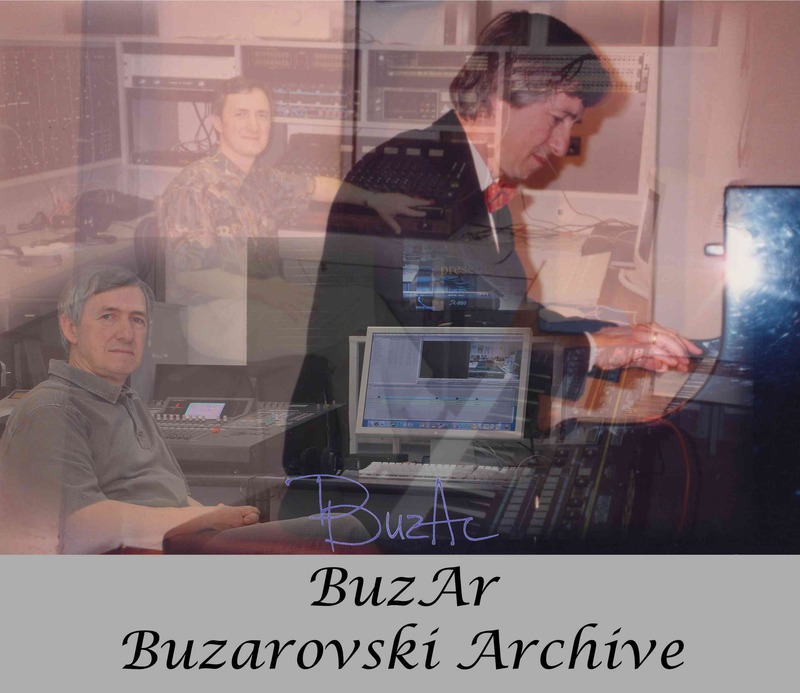 The first samples used in the new audio digital technology were mainly the recordings of acoustic instruments, thus helping the synthesizers to produce bigger variety of sounds. Very soon, the expansion of the capacity of the hardware brought about the first longer samples, i.e. the samples with longer duration, which consisted of the combination of more sounds (such as tympani or cymbal tremollo). 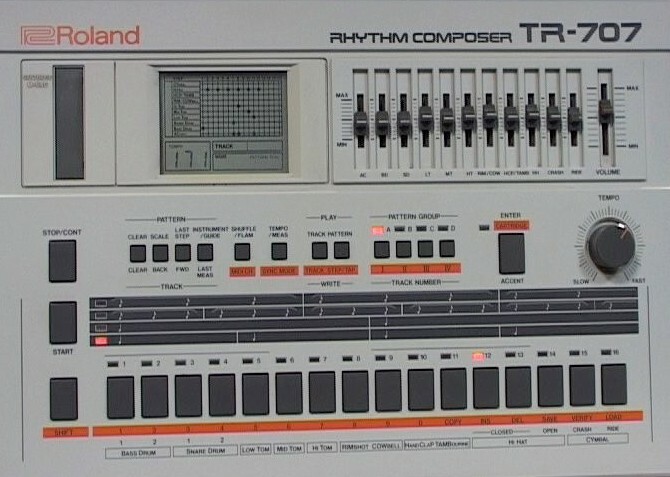 On the other hand, the rhythm machines from the 80s had already employied a combination of the MIDI sequencing and loops with prerecorded samples of percussion. At that moment it was very easy to predict where technology was heading. The first concerns were raised from the copyright societies, as it was obvious that a significant parts of the compositions could be built by the use of the loops. The main question was whether the rights should be partly distributed to the factory which prerecorded the patterns and samples. The further development of the digital audio technology conritubuted to the greater expansion of the variety of loops, which included more and more different sounds, and later the possibility of transposing or changing the duration of the loops from real sounds (transposition and tempo changes were available at the very beginning of the use of MIDI instruments). In the mid 90s, I was often approached by the users of this technology who have very limited, or in some cases no music education, but who were creating music by combining different loops of prerecorded sounds. At that moment, it was perfectly clear that this was a challenge for the traditional way of creating, and consequently teaching music. In the foundation of this creation lay the «collage» technique, which was not unknown and was particularly developed with the musique concrète in the 50s. The concept was entirely the same only the founders of the genre Pierre Schaeffer and Pierre Henry did not have the advantage of DSP editing or transformation of sounds. Meanwhile, the kingdom of loops grew with accelerating speed. With it grew the number of its users, especially in the area where it started - rhythm (machines). This resulted in the creation of an entirely new music practice of the late 20th and early 21st century – the DJ. The D(isk) J(ockey)s were the first to grasp the new technology in structuring a full event. Their main task (music for dancing) brings the rhythm in the foreground – and loops originate from rhythm. «Dancing is a rhythm» – and the loops offered a lot of rhythm which could be controlled. Using loops as a basis enables unlimited prolongation of dancing, thus surpassing the problem of the duration of songs. Although at the beginning DJs were not interested in fixing their work in sound carriers, as the main purpose was the live event, we can already find CDs with DJ music. The use of loops in some of the genres dominating the last decade of globalized music, such as techno, rap, hip hop etc., was probably an interaction. Loops were particularly useful for the permanent repetitions in these genres, very easy to create, and in general they form a very high percentage of the music material (even in some techno pieces, all of it). The adding principle of building the compositions in these genres (the piece usually starts with a rhythmic pattern with a percussion or bass section, and then new elements (patterns, loops) are added one by one, or subsequently), contributed to the use of loops. Loops and the structure of the music pieces of these genres interacted in their development, thus further widening the kingdom of loops. And here we are today, with loops everywhere, from electronic music to all kinds of rock, pop, techno, hip hop, ambient, DJ music etc. The software industry closely followed and responded to this trend. The latest packages with the Macintosh operative systems (OS X – panther, tiger etc.) 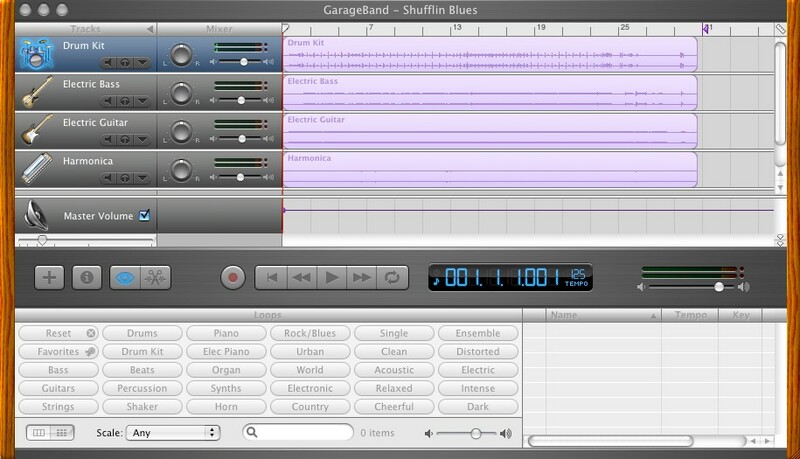 include a free software for audio and MIDI recording – Garage Band. Although with a much lower performance compared to the similar professional packages and mainly targeting the wide audience of music fans, this software is in fact at the level of the professional HD audio and midi recording from the beginning of the 90s. It also reflects our dreams of getting rid of all additional hardware (cards, interfaces etc.) which we needed in the 90s. It was evident that the rise of hardware computing capacity would result in software solutions. The fascinating side of this development is that today, we could even process video without additional hardware (Final Cut for instance). Video needs much more computing power, communication capacity and storage space, than the audio itself. Garage Band comes with a set of hundreds of loops even categorized in different genres (for instance Rock/Blues). The availability of loops is further extened by Internet exchange. There are thousands of loops which can be imported from the Internet. The integrated MIDI instruments in the system software (Quick Time instruments) enable interventions inside the loops, including the change of tempo or transposition. Music pieces could be created faster than their full length (duration), something unthinkable in the past. The integrated mikes in the latest models of Mac computers, add to the karaoke fun of creating music. We should not underestimate the value of the thousands of pieces created by amateurs with these new tools. Some of the compositions I have heard, made by enthusiasts, have a much higher level of creation than a lot of electronic music pieces from the 60s to the 80s. In some cases, electronic music from the past looks naïve when compared to the achievements of the loops collage. We can expect that this development will be accelerated to the extent where we will question the need of new recordings, as there will be enough recorded material to build any kind of music composition. If in the 90s music fans who did not have music education could create music by buying synthesizers, rhythm machines and other modules, nowadays, everyone has access to music tools by bying Mac computers. How does this relate to teaching music composition? In a certain way music composition has always taken advantage of collage for building the overall structure of the piece. Considering the philosophy of computer editing and its three crucial commands copy/cut/paste there are more than obvious similiarities. The first score processors equally introduced the principle of loops by copying, cutting and pasting the repetitions of the same thematic materials, and even whole sections. New horizons were opened up for the faster creation and assembling of the music piece. Consequently, we can not say that the loops principle is not already integrated in the composition courses, and students of composition, especially those who are more inclined to follow the development of technology, are fully aware of these advantages. The question is how professional composers will compete with the army of enthusiasts and amateurs making music while playing with their computers, and how does music education fit into this picture? Some of the answers lie in the history of electronic music. We can find a lot of engineers without elaborate music education, from Leon Theremin to Max Mathews. Bringing our arguments to the utmost limits, we could expand this concept to the link between music and mathematics from the Pythagoreans to Iannis Xenakis. Nevertheless, the sole tools were insufficient for creating music which would surpass the local geographical and historical boundaries. Loops tools are undoubtedly the most developed in the history of music civilization, offering half-processed products to the users. But there was always one feature which immediately distinguished the trained musicians from the auto-didacts: the possibility of creating larger music forms. In fact, at the moment there are almost no large compositions (both in the sense of the form, and consequently in the duration) in all other genres except in classical music. Even the largest compositions in the popular genres – the musicals, are only a collage of smaller fragments. We are not taking into consideration the DJ creations where the duration is controlled by the dancing pattern. Popular 20th century music genres, including jazz, rock, techno, etc., passed the history of western classical music in a condensed form, from the purely vocal tradition, to separate vocal and instrumental idioms (17th c.). The development of the music forms was directly influenced by the development of instrumental music and particularly orchestras. In this sense, large forms can not be built simply by collaging the loops. In most of the music which was presented to me by these enthusiasts, I could immediately notice their inability to develop the patterns into an integrated composition. Unfortunately, their talent and intuition could assist them in only creating small fragments. That is why we have never heard a larger form than a song even from the greatest musicians of the 20th century popular genres. Music forms are only one of the manifold aspects determining the artistic (or artisan) capacity of the contemporary composer. We did not mention all the other disciplines for fear of digressing from the main topic of this paper. During the last 27 centuries, being one of the first disciplines in the history of human civilization (both scientific and artistic, once again thinking of the Pythagoreans), music, in comparison to all other arts, developed the highest level of specialization in the area of technical knowledge and skills. However, knowledge of tools is only a prerequisite and not a guarantee for the artistic and creative results. On the other hand, we can assert that without appropriate knowledge and skills, we can not expect results which will survive the sharp blade of historical selection. All sound compositions sound, but only some are music. There is no doubt that the inevitable kingdom of loops will be adequately integrated in the composition curricula. Pierre Schaeffer and Pierre Henry could be proud of their invention – we are enjoying the results.